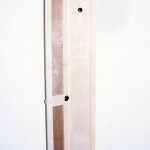 When the viewer first encounters the piece the second hand of the clock is bouncing of the red button, the light is off and the door is closed. 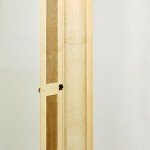 If the door is opened the viewer will find a hole at about eye level. Looking into the hole the viewer sees what appears to be a star filled sky. 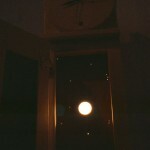 This is achieved by having two mirrors facing each other inside of the clock. Both mirrors have many small holes drilled in them allowing tiny beams of light to enter the clock and reflect of the mirrors into infinity. 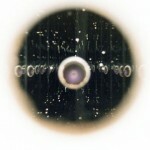 The viewer would see their eyeball as opposed to the lens of the camera as is shown in the picture. If the viewer presses the red button the clock is set into motion and a very bright light is activated inside of the clock thus making it impossible and painful for the viewer to look inside. The cabinet is glowing at this point, as all the holes that were letting light in now are letting light out. Once the button is pushed the piece cannot be restored to its initial state and due to the intense heat of the light, it slowly catches fire and decomposes itself.